Would like to start this post with one tweet of mine "When critics say - script is predictable - are they looking for a murder mystery"? That is my grudge with all critics - that I have never found a single 'nice' review for a nice, small, romantic movie. Is it so because they are not from big big camps? I remember how harsh same critics were on JTYJN too. I do not want to compare JTYJN with JHS, because both are different in a way. Jhootha Hi Sahi is kinda mature one compared to eariler venture of Abbas Tyrewala. Characters are older, storyline is somewhat serious and so are the acts. JHS is story of Siddharth who volunteers a tele service that helps soothe people who tend to do suicide. And on phone, he meets Mishka, the story moves on how they meet each other and the relationship grows. The strongest point of Abbas' movies is always one thing : the Ensemble. He knows how to get some good actors together and how to take out the best act from them. Though JTYJN has one of the best ensemble a movie can ever have, JHS is not different in that way. Most famous face of youth television - Raghu Ram [Omar] alongwith not so famous faces - Alishka Varde [Aliya], Prashant Chawla [Uday], George Young [Nick] and Manasi Scott [Krutika], and John, moments between them are so enjoyable. Though Krutika's character seems to be an extension of Mala [from JTYJN], but never mind cause it has pretty short screentime. Talking about pace, movie's start is a bit slow. In first 10 minutes it almost looks like Karthik Calling Karthik, and then somewhat similar to Anjana Anjani too, but after that it carries its own story. Charming sequences and lovely music. Main advantage of taking unknown faces in such a story that it doesn't overshadow the characters. Omar and Krutika serves as fun track througout - look out for them in second part. While debutant Pakhi as Mishka looks pretty suitable for the role. A role similar to what played by Priyanka in AnjanaAnjani, I would say Pakhi has played it more honestly. Okay, she does look little bit older for such story, but I don't mind when act is comendable. The real star of the movie is John. This is undoubtedly his best performance ever. As a confident guy on phone and a stammering confused guy in real life, he acts ! And most of the running time, he carries the film with him. Given a good ensemble cast and his performance, there are only a few dull moments. I would recommend this to anyone who likes light, cute and entertaining romantic flicks. Don't go with expectations of JTYJN. No. Masterpieces can be made only once, but good products can't be avoided in such comparisons. A first joint venture of Vishal Shekhar and Prasoon Joshi - was the 'to look out for' thing for this album. And definitely they have done a really nice job together. You can see that from the very first track - though 'Adhoore' is a typical VS song, its the words that makes difference [and same is applicable to whole album, lyrics]. Peppy, rhyming words- rhyming yet fresh lyrics makes an addictive start to album. Alyssa Mendonca does great job with Vishal. Next up is Pritam's regular guy - Neeraj Shridhar. Singing a rather different stuff then his regular, Ajab Lehar is nice loveable track. Third track is yet another lyrical bliss - Dhoop Ke Makaan starts smooth with Shekhar's voice later joined by fabulous ladies - Caralisa Monteiro and Sunidhi Chauhan. Dooriyan Hai zaroori - sounds an extended version of '10 on 10[pyaar Impossible], still its a rocking one. Monica Dogra steals the show from Vishal. Next track reveals what this movie is about - Main Jiyoonga will make me cry in the movie, I think. Similarly its English version Don't worry about me touches the right chord more than the original. Former sung by Nikhil D'Souza and later by Vishal. Sidenote : Don't worry is Vishal's most fav track he has ever composed]. Remix of Adhoore is good while acoustic version of Dhoop ke Makaan sounds soothing with minimal arrangements. All in all, its a nice little soundtrack that shines with awesome lyrics by Prasoon Joshi - "Kaanch ka saman tha aur gir gaye hum, chhod kar khud ko banane phir gaye hum". Wah ! Keep 'em coming man ! This is the first time when a soundtrack of SLB's movie, did not impress me at first listen. And being a 'loyal' SLB fan, this has made me disappointed. Still, I am confused about it. Coz as I keep on listening to some tracks, I am loving the tracks. Especially 'Saiba' - sung by Vibhavari Joshi who sounds little bit high pitched for such beautiful composition. Portuguese touch of the song makes it more interesting. By far its my most fav track from album. While title track starts where Saavariya ends, yes, with sound of rain and then some background sounds [of TV?] KK and Shail croons this beautiful track with lovely arrangements. Next track 'Sau Gram Zindgi' [!!?] sounds weird with unusual lyrics, add Kunal Ganjawala's singing toppled with 'angrezi' lines, the track is annoying. Another track - Tera Zikr too suffers from such lyrics. Sample this - "Teri Fiqr Hai, Yaa Faqr hai - jab jab karta hun, machlta hun, uchhalta hun, fisalta hun" - words are put just for the sake of rhyming. Otherwise, both tracks has nice compositions. A short track by KK - Jaane kiske khwaab sounds nice but purely situational. After all slow tracks, a refreshing change comes in form of 'Udi' sung by Sunidhi Chauhan & Shail Hada, latin beats sounds fun. Shail Hada comes next with solo - Keh Na Saku - which does not work as it should. A song about expressing silent love requires more depth. Chand ki Katori is a good pick from soundtrack. Especially Harshdeep Kaur's voice is a highlight of it. But again, some lines annoy me. Strings laden 'Daayein Baayein' is a nice smooth rendition by KK. But its forgettable as soon as you stop playing it. On the other side, why KK sounds ''so'' different in this movie? Another voice that sounds different is Shankar Mahadevan - in last track of album - Dhundhli Dhundhli. A song about lone evening - a standard SLB song that I loved for its composition and vocals. Would love to see on screen. So by far, only two tracks out of ten - that I loved from this album. Lets see how it fares as it keeps growing on me. But still, what bothers me is lyrics part. Lyrics can make or break an album [example Udaan v/s Robot]. As I said on Twitter "Lyrics of Guzaarish, tries hard to be 'Gulzar'ish, but fails miserably." A 70's movie ! Was waiting for its music, also, after extremely catchy 'Zor ka jhatka' - that's a hit by now. Two Punjus - Richa Sharma and Daler Mehndi are in full form for this track with fun filled lyrics. Next track by Shreya Ghoshal - O bekhbar reminds me of a song from Bhatt Bros.' movie. A typical 'Pritamish love song'. Nakhre - sung by Francois Castolliono which was featured in first promo - has nice 'twist' beats - recreating 70's. Lyrics makes it a part 2 of Zor ka Jhatka. Fun. Surprisingly, 'Chhan Ke mohalla' starts exactly same as 'Dhoom again'. But instantly it gets 'wavey jhatka' kinda beats of 'Chor Bazari'. 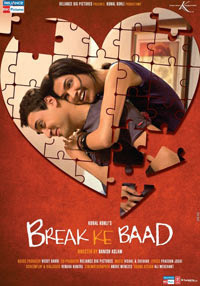 Sunidhi Chauhan & Ritu Pathak along with some addictive chorus singing, the track is interesting. With a good lineup of singers - Karthik, Mahalaxmi and Antara Mitra - Pritam tries to create a love ballad 'Tera Mera Pyar' but fails. Nowhere it touches right chord. Mika is next with Dhak Dhak Dhak, is another passable track. I liked 'Luk Chup Jaana' for its loop sung by Tulsi Kumar. KK starts it well but when it goes on high pitch, wanna be rock, - it ruins the mood. KK's voice get lost in those portions. Another gr8 voice is wasted in 'I am dog gone crazy' - Suraj Jagan. wish SEL could have created a nice alternate. Shreya Ghoshal features again in the last track of album - Baaki Main Bhool Gayi - paas. As the album gets a dhamaakedaar start - it doesn't live up to that. Inconsistent. Some tracks are fun, if given a 70's touch, the soundtrack would have been more fun. There was a time, when Vishal-Shekhar gave fundoo songs for the first installment in this series. Things were above average in next part, and has got bad in the latest. Pritam has done a below average score for Golmaal 3. Using VS' Golmaal tune - Pritam has scored a new one that easily goes off your mind-even when u r playing it. Wasted voices of Anushka, Monali and KK. Kal ho na ho in Pritam style is Apna Har Din - tells to live each day like its last - Shaan and Anushka can't save this song. Neeraj Shridhar and Antara Mitra get in groove with Ale, which sounds good, at least on screen it will look intersting as the pacey beats make it sound like 'cheer' song. Desi Kali by Neeraj [again] and Sunidhi is just another Hinglish Pritam track. Ah Pass it..
whatever has happened to the Diwali releases with great soundtrack ?